Going on a cruise alone is about as fun as watching paint dry. You need someone else to come along to help make fun of the other passengers, to be your partner for the funky chicken dance contest and to oooh and ahhh when there is a spectacular sunset. You need someone to tell you not to hit the buffet line for the third time at dinner and someone who you can share the sights with while you are having the vacation of a lifetime. 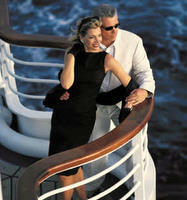 Yes, a cruise partner is in order and with Oceania Cruises you can afford to bring a cruise partner along. The cruise line is currently offering an outstanding deal where you can get free airfare and 2-for-1 fares on their cruises in Europe. What a deal! The cruises themselves aren’t too shabby. You can sail from Barcelona to Istanbul or Istanbul to Venice or, heck, they’ll even let you got from Barcelona to Venice. Now the question isn’t whether you should cruise with someone else, but who you should take with you on the journey. If you need someone who is especially good at the funky chicken, just let me know. I am always game for a good cruise.